Today’s Episode is all about the different levels of communication. 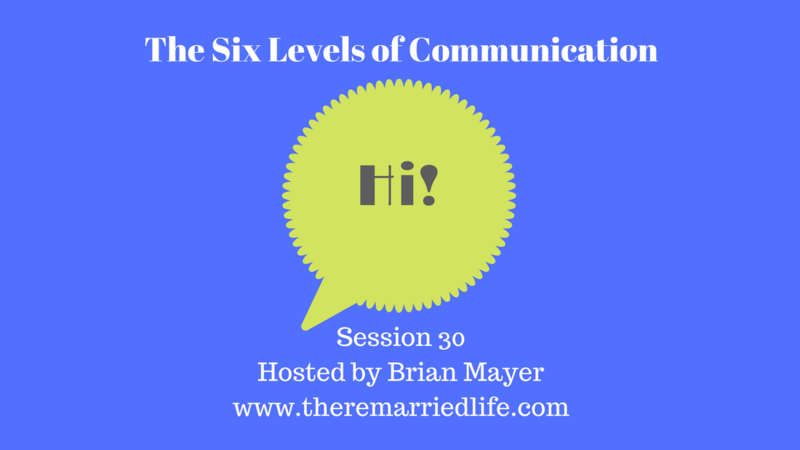 The six levels of communication we will talk about, I attribute to Jimmy Evans who is a speaker and evangelist who focuses much of his time on promoting healthy relationships and marriage. His ministry is called Marriage Today and you can get lots more great information there. The first level of communication is called Basic Information. In this level, you are really only providing information that is needed for basic functioning in a relationship. One example is reporting to your mate that the sink is leaking. Partnership is the second level of communication between spouses or partners. This is where you begin some form of actually working together on problems that may exist. So for example, if you are running low on milk you would ask if your partner could pick some up on the way from home. So again you have taken a step up from simply reporting to partnering together to solve problems. The third level is Conflict Resolution. As course once you begin to start partnering together to figure out a problem, you will invariably bump into each other’s differing views, differing personalities, and differing world views. In this level you may begin to express complaints or criticisms. Complaints are good and actually healthy and involve expressing feelings about a particular issue. Criticism is not good and not healthy and involves moving away from the issue and attacking the other person. The fourth level of communication is Connection. This is the first level in which we move beyond levels in which we find ourselves with family, friends, coworkers, and others. This is what separates this relationship from others. Connection can involve both verbal and non-verbal components like looking into one another’s eyes or touching of any kind. Being fully present and repeating back what is heard of examples of things you can do to strengthen connection. Personal Information Revelation is the fifth level of communication. This is where you work to be more vulnerable with each other regarding your hopes, dreams, and frustrations. This level can be difficult to achieve for some couples, because often sharing hopes and dreams can feel like a win lose proposition rather than a win win scenario. The revealing of these hopes and dreams, Jimmy Evans calls the drawing of the drapes to your heart. You are revealing yourself in a most vulnerable way. Unfortunately, if this vulnerability is met with criticism and negativity too often, it will cause a divide and withdrawal. At worst, it can begin the cascade toward finding someone else to be vulnerable with. Once we feel safe with our hopes and dreams, then we can make it to the pinnacle or sixth level of communication which is Intimacy. Intimacy is where expressions of love, affirmations, encouragement, and all the types of intimacy reside that I talked about in Session 29 – things like emotional, physical, spiritual, intellectual, and experiential intimacy. Discuss these levels with your partner and talk about what it would take to get to that top level of intimacy. The key is to develop a safe haven in your home in which you can each share your biggest hopes, dreams, worries, and fears without feeling put down, minimized or uncared for. You can have the relationship of your dreams if you will cultivate these areas and taken them one a time. If you find that you have difficulty doing this together and need a third party, then seek out another couple you trust, maybe a pastor or even a therapist to help you both uncover the issues that lie between each of you.